Grand Theft Auto V and Criminal Enterprise Starter Pack Bundle (GTA) PC Digital - CD Keys for Steam, Uplay, Origin and more! This is a digital product. It can be activated on Rockstar Social Club. Patner Requirements: Please check the terms of service of this site before purchasing this software. Legal notice: NOTE: Add-on content, Grand Theft Auto V required to play. This content is only accessible in Grand Theft Auto Online, will be marked FREE in-game, and has no trade-in value, including vehicles. After installation, start GTA Online and follow the instructions to claim your items from in-game stores and websites. Rockstar Games, Inc. ©2008-17. 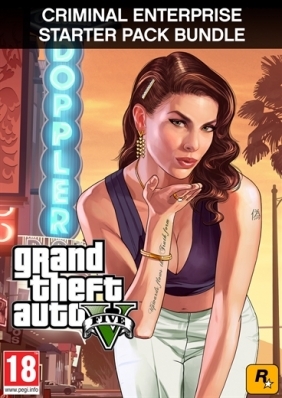 Rockstar Games, Grand Theft Auto, GTA Five, Grand Theft Auto Online and R* are marks/logos/copyrights of Take-Two Interactive. All other marks and trademarks are properties of their respective owners. Dolby and the double-D symbols are trademarks of Dolby Laboratories. Uses Bink Video. Copyright © 1997-2012 by RAD Game Tools, Inc. euphoria motion synthesis technology provided by NaturalMotion. euphoria code is (c) NaturalMotion 2008. NaturalMotion, euphoria and the NaturalMotion and euphoria logos are trademarks of NaturalMotion. Used under license. This software product includes Autodesk® Scaleform® software, © 2013 Autodesk, Inc. All other marks and trademarks are properties of their respective owners. All rights reserved. Software license terms in game and www.rockstargames.com/eula; online account terms at www.rockstargames.com/socialclub. Violation of EULA, Code of Conduct, or other policies may result in restriction or termination of access to game or online account. For customer& technical support visit www.rockstargames.com/support. Non-transferable access to special features such as exclusive/unlockable/downloadable/online content/services/functions, such as multiplayer services or bonus content, may require single-use serial code, additional fee, and/or online account registration (13+). Access to special features may require internet connection, may not be available to all users, and may, upon 30 days notice, be terminated, modified, or offered under different terms. Unauthorized copying, reverse engineering, transmission, public performance, rental, pay for play, or circumvention of copy protection is strictly prohibited. The content of this video game is purely fictional, is not intended to represent or depict any actual event, person, or entity, and any such similarities are purely coincidental. The makers and publishers of this video game do not in any way endorse, condone or encourage engaging in any conduct depicted in this video game. Rockstar Games, 622 Broadway, New York, NY, 10012 T2 Take Two Interactive For information about online services, fees, restrictions, or software license terms that may apply to this game, please visit www.rockstargames.com. You must accept the license available online at rockstargames.com/eula. Non-transferable access to special features such as exclusive, unlockable, downloadable or online content, services, or functions may require single-use serial code, additional fee and/or online account registration (13+). Violation of EULA, Code of Conduct, or other policies may result in restriction or termination of access to game or online account. Access to special features may require internet connection, may not be available to all users, and may, upon 30 days notice, be terminated, modified, or offered under different terms. The content of this videogame is purely fictional, and is not intended to represent or depict any actual event, person, or entity. The makers and publishers of this videogame do not in any way endorse, condone or encourage engaging in any conduct depicted in this videogame. Unauthorized copying, reverse engineering, transmission, public performance, rental, pay for play, or circumvention of copy protection is strictly prohibited. Certain limits apply to purchase, use, and redemption. See EULA www.rockstargames.com/eula and Terms of Service www.rockstargames.com/legal for details.